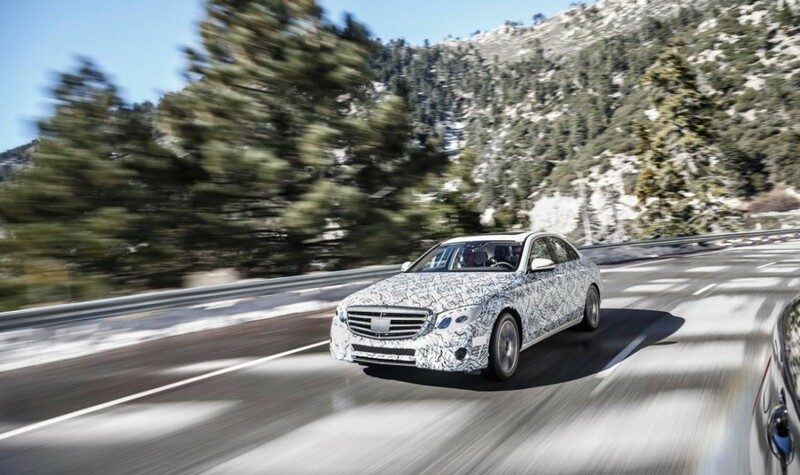 There are no paparazzi hunting the upcoming Mercedes-Benz E-Class in no man’s land between the Californian mountains and Nevada, where the 2016 Mercedes-Benz E-Class is testing its innovative features. The prototype is still heavily camouflaged, although the premium brand has already revealed its interior and – unwillingly – so much of the exterior design cues. Before getting into the stands at the Detroit Auto Show in mid-January, the E-Class is being put through its paces. Probably one of the last before its official presentation and market debut. But what is there left to check on this last hundred yards? Some last tuning of the drive system, suspension and the engineers want to make sure that the countless comfort and safety systems work clocklike. The always sunny California is just the perfect place for those final tests that take the car of the future from Los Angeles to Las Vegas. Sunny indeed, but snowy as well, as the peaks of the Big Bear Mountains shine covered in bright white layers. The winding roads will test the DRIVE Pilot system, while project manager Michael Kelz keeps his hands off the wheel, giving full freedom to the luxury sedan. Braking, accelerating and steering, the preproduction prototype of the Mercedes-Benz E 400 does it all. It was 4 p.m when the Mercedes-Benz team started out on this journey. The night is setting in now. The road ahead is illuminated by the multibeam LED headlamps. The Interstate 15 is busy, but the car overtakes by itself. Occasionally, a visual request in the instrument cluster asks Michael Kelz to take back control. A glide on one of the two touch controls on the steering wheel tells the car it’s ok to continue its autonomous driving. Meanwhile, the driver could easily make use of the spare time, but the legal framework will not allow it. The control of the car is still his responsibility at all times. One day, changing the settings in the car’s software will be enough for it to adapt to the local legal circumstances. But not just yet. “That is why we have a lot of instructions in the manual and a multi-stage warning strategy to ensure that the driver regularly takes hold of the wheel,” Michael Kelz explains. Getting closer to Las Vegas mile by mile, the car rolls quietly, defying the poor road surface soon after leaving the what seemed to be the endless Interstate 15. Once arrived in the city of gambling, the E-Class is easily manoeuvered into the tight parking spot, all using just a smartphone. Even those who have built the system and have been testing it for months now, stand and stare in amazement. Probably, we are not even ready for the future Mercedes-Benz E-Class and everything that it is programmed to do. 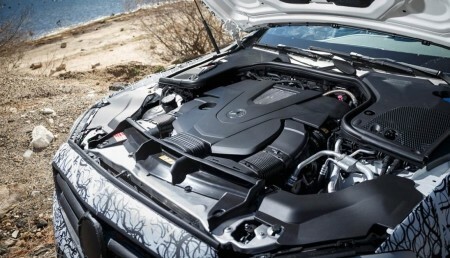 Check out the interior of the 2016 Mercedes-Benz E-Class and everything that the luxury sedan can do in this article: All new 2016 Mercedes-Benz E-Class interior fully revealed (with video).